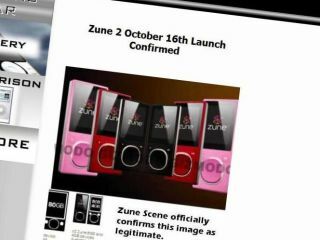 New Microsoft Zunes are on the way for 16 October, says Zune Scene. But after Apple's recent iPod touch, 'fat nano' and 160GB classic launches, it's tempting to say: "yeah, but so what?" Microsoft's second bash at attacking Apple's iPods certainly look better. If the picture on Zune Scene is genuine, they look visibly thinner too with a neat 'squircle' (square circle) nav-pad. The flash-based Zune, a.k.a 'Draco', reportedly comes in 4GB and 8GB sizes. Its bigger brother is an 80GB model - the HDD-based Zune, a.k.a 'Scorpio'. But is it enough to break Apple's stranglehold on the MP3 player market? From our perspective, the new Zunes don't look like a real leap forward - a 1.5G version rather than a 2.0 device. Microsoft is certainly making headway. But the new Zunes look a year to 18 months behind Apple's iPods, both in terms of innovation and sheer fan-boy appeal. There's no word on UK availability.